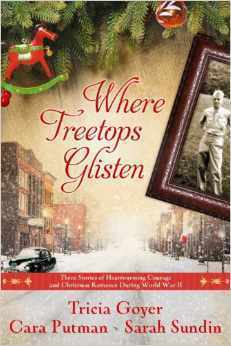 Where Treetops Glisten is a collection of 3 related novellas. The book as a whole centers around one family, with each story told by a different sibling. It is a book that is full of the warm and fuzzies of Christmas. This is absolutely a Hallmark movie in book form. The "bad guys" aren't very bad and there is a ton of Christmas cheer in each of the three short stories. Each story takes place in a different time during World War II, and yet with such a dramatic backdrop, the stories never take themselves too seriously. The point of this book is to make you happy- and this book achieves like a warm mug of hot chocolate. I have only read other books by one of the three authors, but their different writing styles blended together well. I could tell that each part was written by a different person, but not in a distracting way. This would make a lovely Christmas gift to anyone who likes light romance stories with a historical setting. I have this book and I still need to read it! Nice review!